In addition to Miranda’s own headlining tour, she is also joining Kenny Chesney on his “Spread the Love” Tour performing in stadiums around the country starting in April. And for the first time, Miranda will perform for her fans overseas, on March 11th in London (UK), on March 12th in Dublin (Ireland) and March 13th in Glasgow (Scotland) as part of the Country to Country Festival 2016 (C2C). Fans can purchase tickets beginning Jan. 29 for select cities as part of Live Nation’s Country Megaticket at www.Megaticket.com. Check Mirandalambert.com for specific show announcements and on sale dates. About Miranda Lambert: Grammy Award winning singer-songwriter Miranda Lambert is the reigning six-time CMA and six-time ACM Female Vocalist of the Year (the first time any female has won 6 consecutive years). The first single off of Lambert’s fifth studio album, Platinum, “Automatic,” was Lambert’s highest charting first week single to date and won CMA and ACM “Song of the Year”. Her duet with Carrie Underwood, the album’s second single, “Somethin’ Bad,” has been certified as an RIAA Platinum Digital Single. Platinum, made history when it debuted atop Billboard's Top Country Albums Chart, making Lambert the first country artist in the history of the chart to have each of her five albums debut at number 1. Platinum also debuted at the top of the all genre Billboard 200 as the number 1 album in the Nation. In addition to her award winning music, she dedicates much of her time to her MuttNation Foundation, an organization that supports shelters and helps pets find a forever home. She also owns two lifestyle boutiques, general stores she named, The Pink Pistol, that are located in her hometown of Lindale, Texas, and Tishomingo, Oklahoma. 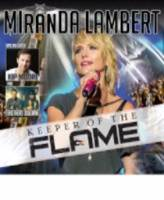 Visit www.MirandaLambert.com for specific date announcements.